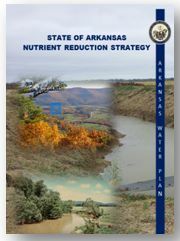 Initiated by the 2014 Arkansas Water Plan update and Arkansas's participation in the Gulf of Mexico Hypoxia Task Force, the Arkansas Nutrient Reduction Strategy (ANRS) is a strategic framework that outlines opportunities, both regulatory and voluntary, which are available to improve overall aquatic health and viability in Arkansas waters for recreational, economic, environmental, and human health benefits. The ANRS is not a regulatory document and does not supersede existing water laws governing water quality issues in Arkansas. Rather, it focuses on outreach and "grass-roots" implementation of nutrient reduction activities. Arkansas has invested significant effort to address point and non-point source nutrient loading through state, federal, and private partnerships. Partnerships with local, county, state, federal, non-profit, academic, and for-profit private sector entities are necessary for: a) mobilization and coordination of available resources, b) consistent interpretation and implementation of water management policies, c) long-term support at the national, state, and local levels, and d) advancement of science-based technologies, methods, and new nutrient reduction techniques. Pursuing market-based opportunities and solutions. 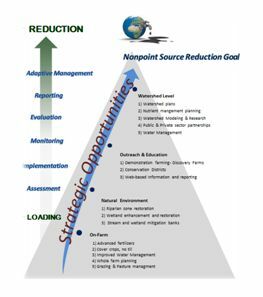 An integrated approach, as defined in this strategic framework, represents a "sustained multi-discipline, multi-sector effort to reduce point and non-point nutrient loading and improve water quality through publicly supported strategies." These efforts require consistent cooperation and communication on the "ground-level" and represent a "bottoms-up" versus "top-down" approach to nutrient reduction. Arkansas's Soil and Water Conservation Districts are on the "ground-level," active in local communities, and pioneer the implementation of innovative practices. These "grass-root" connections are essential to working with private, state, and federal entities to improve water quality through public policy, public outreach and education, project implementation research, and water quality monitoring in priority watersheds.